Removed from the crazy traffic between MM Alam Road, Liberty Market and Mahmood Kasuri Road, Forklore is quietly tucked in Pavilion Mall next to the Mercedes showroom. Upon entering the eatery, one thing struck me immediately: it had a snug feeling, almost like you’re entering your own dining room. The interior is minimalistic but tasteful. The lights are dim but there is enough light to be able to see your food. It has tables of four nestled along the side. When you enter the front dining area, you have a clear view of the kitchen. I was greeted by the host who showed me to my table. It was a quite Thursday night and I was the only person there, thus far. The concept of live kitchens is trending these days. The kitchen is front facing and you can quite literally see what is going on inside. I caught up with the owner to understand his vision of this cozy eatery. Ahsan explained that the food culture in Lahore is buzzing. As such, it is difficult to find an intimate place to eat. This is what he wants to provide for those who want a night out on the town but in a completely relaxed environment. Ahsan is an engineer by profession. With Forklore, he wants to tap this niche and this is the reason he chose this location. He explained how the menu is made in a way, which allows everything to be made fresh, in-house. Ahsan does not want to be yet another restaurateur who imports everything from abroad. He wants to go local in order to source fresh produce daily, developing a relationship with local smaller vendors to support their business. The menu reflects the owners vision- everything on his menu can be easily sourced locally. I found this ethical approach refreshing. We are all in the pursuit of imported items, especially when it comes to food, that we so easily forget all the good things our local vendors have to offer. 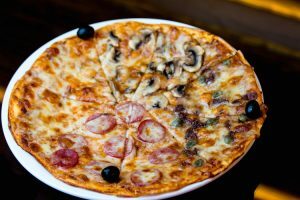 The menu consists of all your usual suspects when it comes to comfort food: soup, starters, stir fry, sandwiches, pasta and pizza. 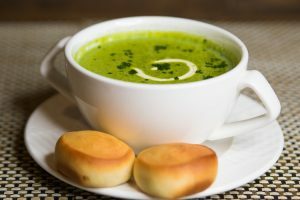 I ordered the mushroom soup and golden bites. I must admit my hesitance in ordering the golden bites as prawns are always a hit and miss in Lahore. My soup arrived within ten minutes of ordering. It was served with bread rolls that I admit were not the highlight of this order. The mushroom soup tasted decent but I was mildly surprised to find chicken in my soup. When I order mushroom soup, I want pure and proper mushroom soup but I guess most people prefer their soups with some form of acceptable protein. My prawns arrived shortly after. I was relieved when I couldn’t smell anything off about them. 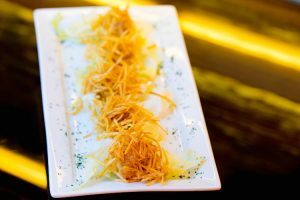 Golden bites are battered prawns tossed in honey mustard sauce, covered with deep friend julienne potatoes served on a bed of lettuce. The prawns tasted fairly decent. After starters, the mains arrived: cannelloni; the Forklore Signature Pizza and the pistachio crusted fish. I was quite excited about the cannelloni as I was informed that it is freshly rolled everyday. 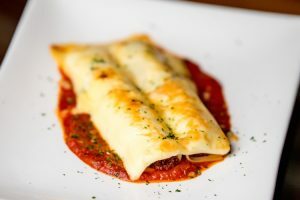 The cannelloni was described as hand rolled with mince beef, spinach and ricotta filling, served on a light tomato sauce with parmesan. I immediately dug into the hot cannelloni: the pasta was al dente, just how I like it. However, the beef mince seemeda bit dry, the tomato sauce was alright, but there was a lack of ricotta and spinach in my opinion. It was topped with what seemed like a mixture of mozzarella and cheddar and was certainly taking away from the flavor of the beef and sauce. The cheese did not sit well. I would have simply preferred parmesan shavings instead. I moved onto the Forklore Signature Pizza that promised the following toppings: Mushrooms, Mozzarella, Anchovies, Capers, Olives and Pepperoni. All save for the capers and anchovies are standard for pizza toppings. The pizza was thin crust and cooked properly all the way through. The crust, sauce and toppings were good- again my only issue with this was the mix of cheese used. I would rather have a less cheesy pizza with good cheese- quantity does not equate to quality in my book. A common complaint I have with pizzerias in Lahore, in general, is how quality is often compromised for quantity when it comes to cheese. A little bit of high quality cheese goes a long way! At this point, I was quite stuffed but the pistachio crusted fish with a pomegranate reduction looked extremely promising. 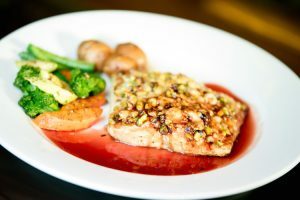 The sole fillet was crusted with roasted pistachios and parmesan, served on a pomegranate reduction and with roasted mixed vegetables: potatoes, carrots, green beans and broccoli. I took one bite that led to another and another until I was half way through. 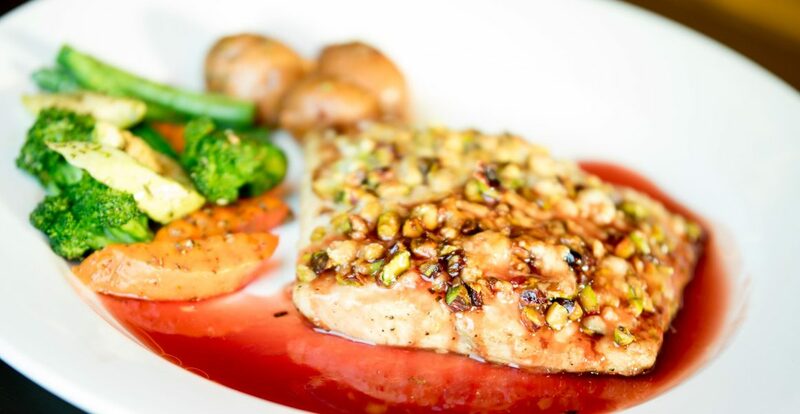 The fish was well seasoned, the roasted pistachios lent a warmth to the fish, the pomegranate reduction cut through this warmth with a sweet and tangy flavor. This was perhaps my favourite as it was perfectly balanced. I was too stuffed to eat all my vegetables but dug into a few beans, which to my surprise were not over done: well seasoned and still crunchy! Needless to say I did not have room for dessert! All in all, the experience was good. The ambiance was great, the wait staff was very patient and attentive. The food was reasonably good. However, there is definitely room for improvement. Forklore has a lot of potential both in terms of its location and what the menu offers. I would definitely go back for the fish and pasta!